International audiences continue to be fascinated by vampire lore and the recent spate of vamp-as-romantic-hero texts is a testament to this: Twilight, The Vampire Diaries, True Blood. How will a film like Priest, which traditionally depicts vampires as soulless villains, fare in this Edward-versus-Jacob-obsessed world? It’s hard to tell. Priest is loosely based on Min-Woo Hyung’s series of Korean graphic novels of the same name. It tells the story of an anonymous priest (Paul Bettany – The Da Vinci Code, A Knight’s Tale) who, along with many others, may wield the power of God. These gifted citizens are divine soldiers and are the only ones equipped to defeat the barbarous vampires. After years of peace, the priests are left religiously unemployed. 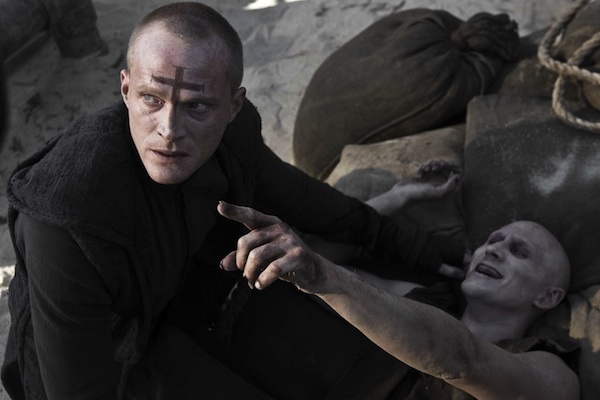 However, when vampires kidnap a young woman, Bettany’s character must rebel against the Clergy and reprise his vamp-killing ways to rescue her. With Priest, vampires are portrayed as eyeless and unsympathetic alien-like creatures. They live in self-constructed hives and have their own social hierarchy, with a Queen who presides over four-legged drones and workers. Through an animated opening sequence, we’re told that humankind and vampires have fought for resources and warred for survival since the beginning of time. But with violent events occurring in Afghanistan at the moment, one can only think, ‘What about a human-vampire truce?’ A rebuttal to this suggestion might be, ‘Well, those vampires lack empathy. They’re just wild carnivores that must be eradicated.’ I have only one response to this. There was once a time when humans and wolves similarly competed in the wild. However, our species was intelligent enough to domesticate and breed certain wolves into loyal ‘best friends.’ So, why hasn’t anyone in this world of Priest captured and tamed, or even experimented on any vampires? It’s a legitimate question that weakens the logic of the film and, perhaps, graphic novels. On another film-bashing note, the distinction between good and evil in Priest is very claustrophobic. Humans are morally varied, but all vampires are evil. This whole idea of slapping the ‘bad’ label on all things alternative is antiquated. It just reminds me of John Wayne and his shudder-inducing role in The Searchers. In this film, Wayne gathers frontiersmen to reclaim his niece, who has been kidnapped by Comanche’s. Of course, these Native Americans are ‘all’ savage and uncivilised, and must learn their place in the colonised world. * These political narrative holes in Priest are not the only factors that work against the film. Sure, it boasts exciting 3D visual effects and fight-scenes but the acting is very two-dimensional. 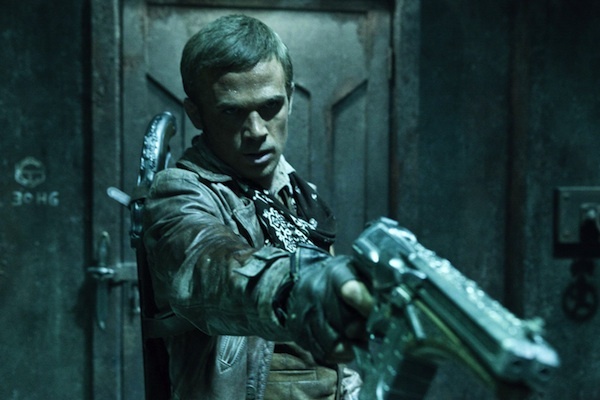 For example, Cam Gigandet (Twilight, Easy A) is flat as Sheriff Hicks. His previous role as a vampire may have been a studio tactic to entice the millions of Twi-Hards into cinemas. However, with his corny dialogue and stiff Zoolander-esque expressions, he is an artistic disservice to the film. Perhaps my discontentment with Priest stems from the fact that I’m reading it in secular terms – something that both the film and graphic novels are not. Much like director Scott Stewart’s previous feature Legion, Priest is full of Christian references and symbology, with crucifix-shaped ninja stars and voice-activated confessional booths. I just hope that, with the sequel (if one is made), there’s more insight into the vampires’ perspectives and ideologies. After all, for a highly organised species, vampires must have their own sophisticated forms of communication à la bees and ants. I certainly wouldn’t mind subtitles. 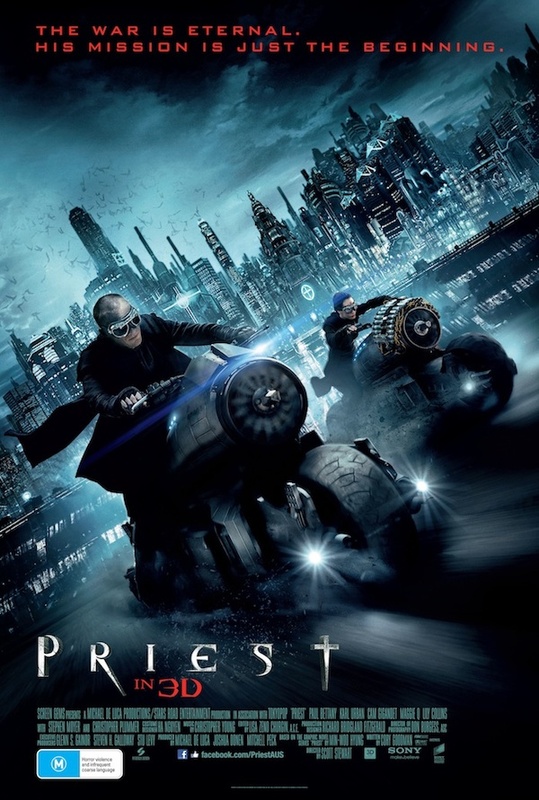 For better or worse, Priest is the type of Hollywood blockbuster that will sell through the roof. Champagne showers are probably pouring for Tokyopop and Screen Gems as I type. However, if I’d wanted to watch a graphic sci-fi vampire film with characters that rebelled against a futuristic autocracy, I would have stuck with the forward-thinking Underworld. *After writing this review, I was shocked to discover that Priest is indeed a tribute to The Searchers. Double Yuck!